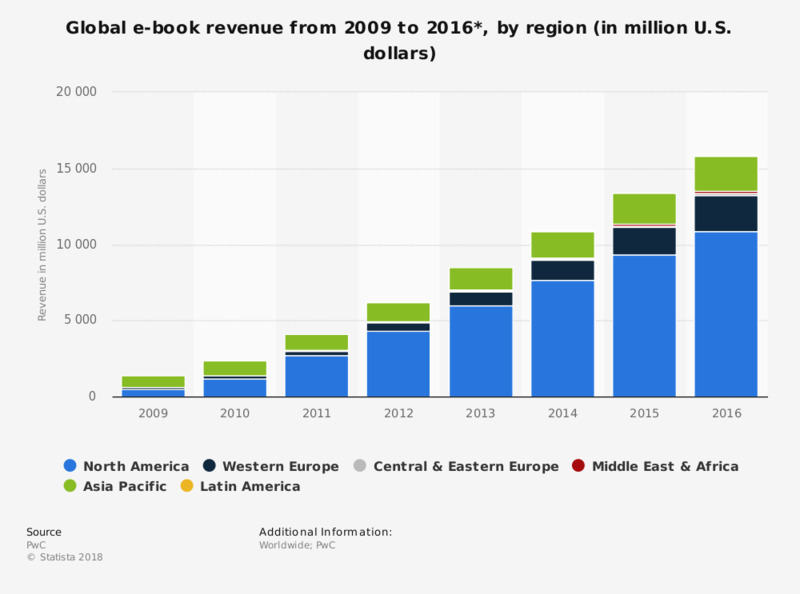 This statistic shows global e-book revenue from 2009 to 2011, and a forecast thereof to 2016, broken down by region. In 2010, e-book revenue in North America amounted to 1.2 billion U.S. dollars and was forecast to grow to almost 11 billion U.S. dollars by 2016. The revenue from trade e-book sales stood at 1.1 billion U.S. dollars in 2011 and grew to 1.4 billion U.S. dollars in 2015. Electronic books have been around for over twenty years, but it was not until the recent mobile revolution that the medium’s revenues began to reflect its potential. The North American market, boosted by surge of interest from consumers in the United States, is one of the fastest-growing e-book markets in the world, but growth in Western Europe and the Asia Pacific region is predicted to increase. Between 2008 and 2012, the unit sales per year increased by over 400 million units, and by 2018, the e-book share of total book sales is expected to grow to over 25 percent, more than doubling its share from 2013. Whereas electronic book consumption and revenue is expected to grow, almost all print book categories are expected to decrease. Consumers are still refraining from completely embracing the e-reader and e-book trend. A survey of U.S. readers in 2015 revealed that 47 percent only read hard copy books, while only four percent only read e-books. Unsurprisingly, younger people are more likely to be e-book readers, especially as many of the newer e-reading devices are also tablet computers or smartphones, giving consumers even more reason to have these devices around on a more regular basis. * The figure for 2011 is preliminary. 2012-2016 represents a PwC forecast. What kind of books would you like to be able to download with an e-book flat rate? What makes you consider an e-book subscription? Which e-books would you like to receive with an e-book subscription?